Let’s first take another look at the old version. It connects to a GrandMA console relying on a hardcoded username (‘andy’) and an empty password. Back then I didn’t have the time, need and energy to care about how these things are implemented. 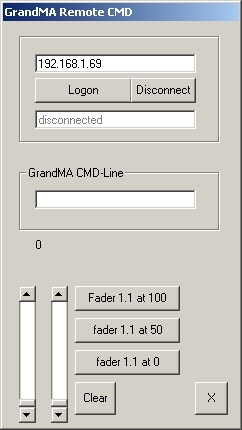 In addition to the pure commandline a small set of functions (2 faders, some buttons) is implemented. It only works on Windows. This is a limitation which makes it somehow senseless to have a remote command line. Because…. well … I might call it common sense. Reading the old post and looking at the old source-code I realised that there were some imprecise statements. Some would say that the main parts were just plain wrong so it’s reasonable enough to do fix this within a new post. Here is a quick recap of the original idea: The GrandMA lighting desk provides a local command-line Interface which basically gives you access to everything you would otherwise achieve via a combination of mouseklicks. There’s also the possibility to run multiple consoles within a network and you could use another console’s interface to remotely access a command line. In addition there was a software for the PocketPC-platform which -among other things- allowed access to the console’s command-line via network. There’s probably also some IOS-Version floating around but it seems to be outdated. To make things a little more weird complex there even was a PocketPC-emulator. 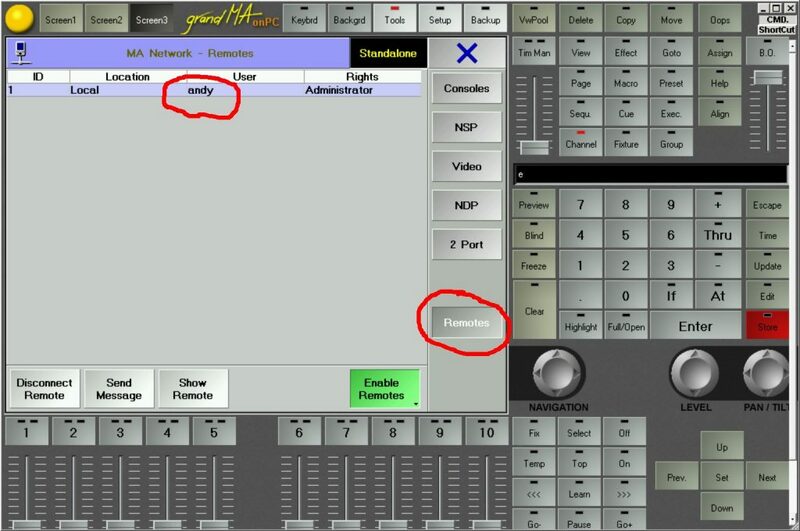 This means instead of simply running an instance of GrandMA onPC on your Windows-computer and connecting this to another GrandMA console you could start an emulated version of the PocketPC-software which not only had a reduced set of buttons but also successfully emulated the actual screen size of the PocketPC’s display. Trust me: THAT thing is a true PITA to use. As I mentioned in the original post there a some things I will probably never understand. But who am I to complain: Using the PocketPC emulator on a Windows-PC to remotely access the command-line on another PC and analysing the data with Wireshark sets the base for my implementation of a remote command-line. Here we go: Situated on the left is my terribly outdated and faulty laptop which I revived because it still had an installation of the PocketPC emulator. Realise how the emulator perfectly ( and senselessly ) maps the original screen size of the PocketPC. An instance of Wireshark is also running in the background. 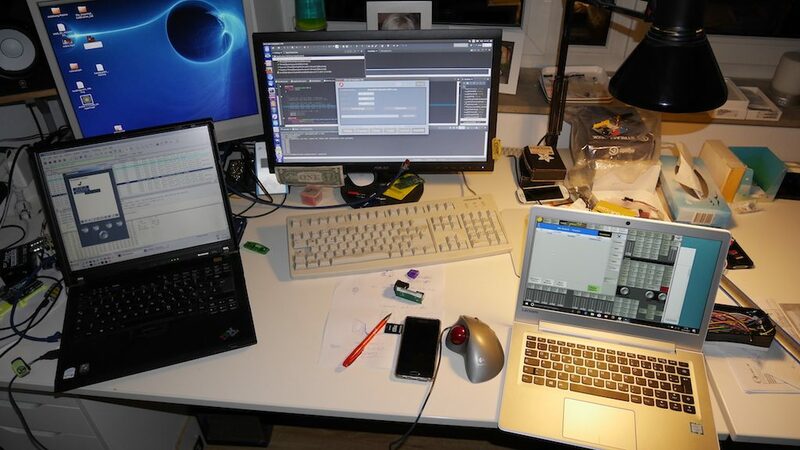 The centre Screen shows is my Linux-desktop running eclipse and the implementation of the remote CMD. On the right is my girlfriend’s laptop running the latest version of GrandMA onPC version 1 (she doesn’t know it but she always has the latest version on her Laptop – god knows how). The first steps consist of opening a TCP Connection to port 7003 und 7001 of the remote console. An initial handshake-signature is sent to port 7003. This signature seems to differ everytime but I am using a constant signature for a few years now and until now there were no signs of this being a problem. The actual username is directly sent afterwards within one single TCP-packet. Keep an eye on sending a username of the correct length as specified in the packet before. If you mess this up you can instantly crash the console via remote (tested with GrandMA onPC v6.808). If you REALLY want to mess with other people’s setup … this is a good place to activate your 1337 3V!L H4XX0|2 M0|)3. It is now necessary to connect to port 7002 at the remote console. This port is used to transmit graphics-data: a blinking cursor, for example. It is not necessary to send any data via this connection, just the connection itself is needed in order for the login to proceed. A few more details on this can be found in the original article. Here’s the complete code for the application. Core elements of it are quite thoroughly commented, I think. If you are facing trouble using the code feel free to contact me and I will send you a compiled version of the program. If you are using these pieces of information within your own application please let me know – just because I’m curious and it would be a nice gesture. * GrandMA Version 1 remote command line interface. 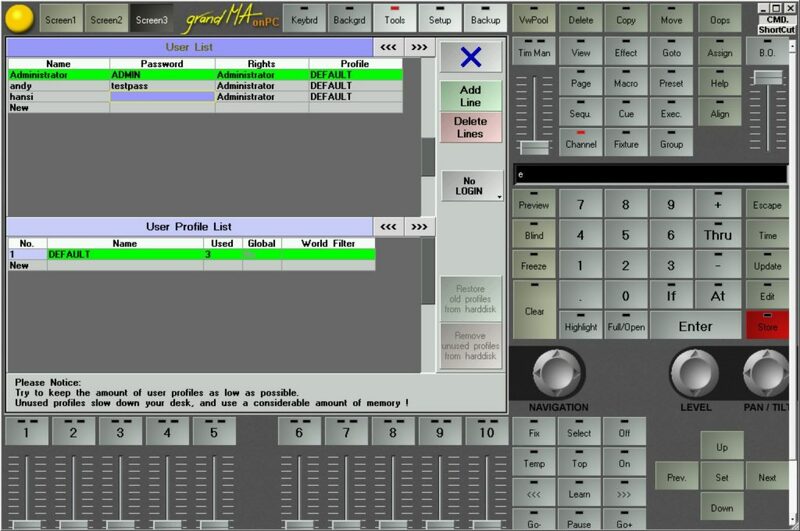 * This is an example of how to implement a remote command line interface for GrandMA version 1 Lighting desks. * There's probably enough room left for future improvement. * Feel free to contact me if anything is left unclear. lblTarget.setPreferredSize(lblTarget.getSize()); //This stops the element from automatically resizing because of its inner text. //----A handshake is sent. I am not quite sure if it's okay to send ~something~. //----Looking at my wireshark-log the handshake is different every time. //----via remote. Tested with onPC v6.808. //----Otherwise the login will hang. One thing his connection transmits is the blinking cursor from the console. //---This is not reliable. It only shows that the logon()-method finished successfully. //---There could be issues on the GrandMA-side of the connection leading to you not being logged in. * Sending the command to the remote console. * Every character is encapsulated into a packet with a length of 4 bytes of data. * looks like it's supposed to. Furthermore you still have the benefits of a GridbagLayout. Tagged DMX, GrandMA onPC, Java, MA Lighting, raspberry pi, Remote CMD. Bookmark the permalink.